Pumping furiously, engineers of the steamer Tahiti kept their ship afloat for two and a half days after a broken propeller shaft pierced her hull. RMS Tahiti was a twin-screw steamship of 4155 net tons, built on the Clyde in 1904 and purchased in 1911 by the Union Steamship Company of New Zealand. Fitted with high-power wireless equipment early in her career, she set records for long-distance communication. 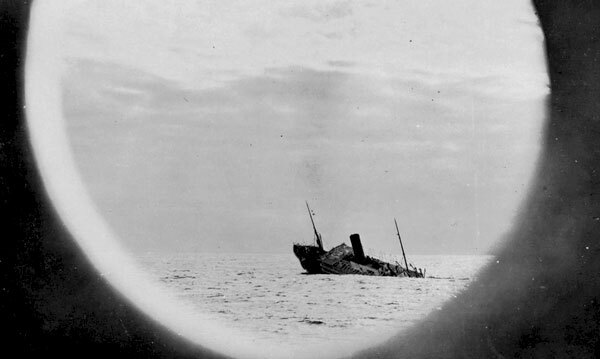 RMS Tahiti sank on 17 August 1930, west of Rarotonga, while on a passage from Wellington to San Francisco. All of the 149 crew and 103 passengers were rescued, thanks to an SOS call that brought two ships to her aid. 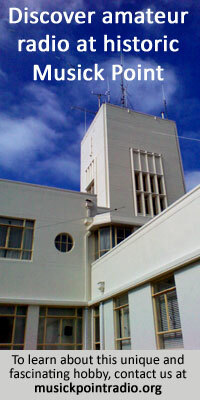 At 4.30 a.m. on the 15th August (western time), she being approximately 480 miles south-west from Rarotonga (latitude 20° 43′ south, longitude 166° 16′ west), violent crashing noises were heard from the direction of the starboard main shaft tunnel, with very heavy vibration of the ship, followed by violent racing of the starboard engine. The second and fifth engineers, who were on duty in the engine room, hastily shut off steam, the engine stopped abruptly, and the second engineer ran through the bulk-head door and along the starboard tunnel to locate the cause of the violence. The length of the tunnel is 100 feet, and the second engineer covered just over half the distance when he was met by a low wall of water that was rushing towards him. He could see to the far end of the tunnel and in the one quick look that he was able to give he saw that a rush of water was pouring across and upwards from the starboard side of the ship to the port side, the flow covering in area the whole end of the tunnel from the floor to the ceiling. Though from long custom called a tunnel, the place in question has the appearance of a lower hold. It is 8 feet in height and extends from side to side of the ship, so that both port and starboard tail shafts are, in this region, covered by the one tunnel. The second engineer raced back to the engine room to get the door in the bulk-head closed, the onward rush of water keeping pace with him so that before the door was closed water was pouring through it into the engine room. Word was at once sent to the master, to the chief engineer, and to the officer on the bridge. Officers and all hands were called, all pumps were started, hand-pumps were rigged and manned, and wireless messages announcing the danger were sent out. Some of the officers of RMS Tahiti at the time of her sinking. L-R Top: A Toten (Master), A Thomson (2nd Engineer), E Denby (3rd Engineer). Bottom: F Davidson (Chief Wireless Operator), R Patchett (2nd Wireless Operator), F Ferguson (Purser). Through pumping, and bailing with 44-gallon barrels, the ship was kept afloat for two and half days. At 10.10 p.m. on the second night (the 16th) the Norwegian steamer Penybryn, which has responded to the Tahiti’s wireless S.O.S. calls, and had picked up her position from the distress rockets sent up, arrived and stood by throughout the night with her flood lights thrown over the Tahiti, and her crew ready to man their boats to go, if needed, to the assistance of those on the Tahiti. At 9.30 a.m. on the 17th the chief engineer reported that conditions were critical but that he hoped to be able to control the water for about an hour longer, and orders were then given by the master for the passengers to abandon the ship. 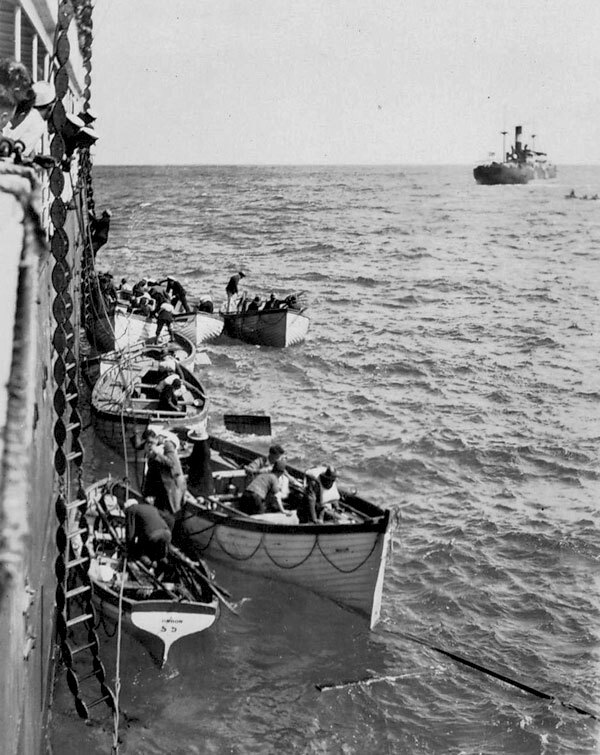 Within 13 minutes all the passengers were got into the boats and away from the ship, and they were shortly afterwards picked up by the American steamer Ventura which had also responded to the S.O.S. calls and had been rapidly approaching, and had sent word that she was ready to take care of all passengers and crew. All the other Tahiti boats were manned by the Tahiti’s crew and brought alongside to save the first class mails and the luggage. From then till the early afternoon the fatigued crew, assisted by one of the Penybryn boats, carried out this work. At 1.35 p.m. the vessel was settling rapidly, the engineers’ position below became too dangerous to remain any longer, a final order was issued for remainder of crew to abandon the ship and after master and chief engineer had personally searched the ship to see that no one was left behind, the last boat containing the bo’s’w’n, carpenter, wireless operator, the engineers, the mate and the second mate and the master, abandoned the ship. Passengers and crew from RMS Tahiti reach the Matson liner SS Ventura. The Norwegian freighter Penybryn is in the distance. 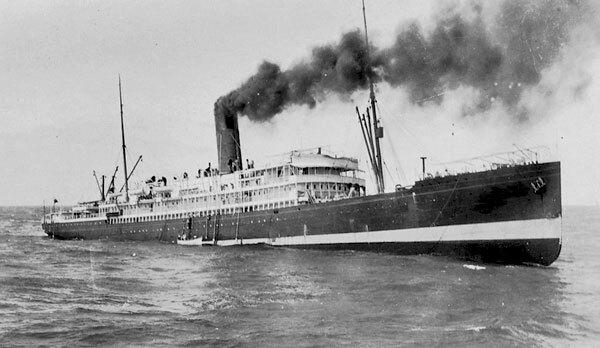 The Norwegian freighter Penybryn was the first vessel to reach RMS Tahiti after picking up the SOS call.